NCCS’s definition of a survivor, from the time of diagnosis and for the balance of life is now the norm for the cancer community and beyond. 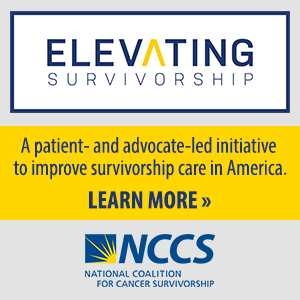 NCCS has expanded its definition of survivor to include family, friends and caregivers. Comprehensive Cancer Care Improvement Act (CCCIA), 109th -112th Congresses; reintroduction in the U.S. House of Representatives in December 2011. NCCS has been a leader in legislative efforts to develop and advance legislation to establish a Medicare service for cancer care treatment planning that would contribute to the delivery of coordinated cancer care. The bill, first introduced in the 109th Congress by Representative Lois Capps (D-CA), has enjoyed bipartisan support in subsequent Congresses. The legislation is also supported by patient advocacy organizations, professional societies, cancer researchers, and leading cancer centers across the country. In late 2011, Representatives Capps (D-CA) and Charles Boustany (R-LA) reintroduced the legislation (H.R. 3705) in the House and in February 2012, Senator Landrieu (D-LA) reintroduced the legislation (S.2097) in the Senate. NCCS looks forward to a reintroduction of the legislation in the 113th Congress. Institute of Medicine Workshop on Patient-Centered Cancer Treatment Planning: Improving the Quality of Oncology Care, 2011. In early 2011, NCCS partnered with the Institute of Medicine’s National Cancer Policy Forum to convene a workshop addressing patient-centered cancer treatment planning. The workshop reviewed best practices in cancer care planning and strategies to enhance adoption of cancer care planning in all sites for cancer care delivery. Findings of the workshop have been broadly disseminated to influence current cancer care practice. FDA Citizen Petition, 2006-2009. NCCS and ASCO filed a Citizen Petition with the FDA requesting clear standards for expanded patient access to investigational therapies. In August 2009, the FDA finalized two regulations that refine FDA procedures and improve patient access to investigational drug therapies. Medicare Palliative Care Demonstration Project, 2010. NCCS secured passage of a Medicare hospice demonstration project that was introduced as a provision of the Comprehensive Cancer Care Improvement Act. The Medicare hospice concurrent care demonstration project, enacted as a provision of the Patient Protection and Affordable Care Act, would test the impact of providing Medicare beneficiaries hospice benefits as well as all other Medicare benefits. The demonstration project will last three years in not more than 15 sites. Medicare Coverage of Oral Anti-Cancer Drugs and Off-Label Uses of Cancer Drugs, 1993 NCCS joined professional societies and other patient advocates in supporting legislation to mandate coverage of oral cancer drugs that were equivalent to intravenous therapies and also coverage of off-label uses of cancer drugs. These provisions to ensure cancer patient access to important therapies were included in the Omnibus Budget Reconciliation Act of 1993. Access to Oral Cancer Therapies, 2000-2003 NCCS joined other cancer advocates, providers, and research companies in a legislative effort to secure Medicare payment for oral anti-cancer agents. By the close of the 107th Congress, three-quarters of the House members and more than half of Senators co-sponsored the Access to Cancer Therapies Act. The measure was enacted as a provision of the Medicare Modernization Act of 2003 and implemented as a transition benefit in advance of implementation of Medicare Part D.
Coverage of Cancer Drugs in Medicare Part D, 2003 NCCS joined other cancer advocacy organizations in pursuing a policy to require coverage of “all or substantially all” anti-neoplastics in Medicare Part D, an effort intended to eliminate barriers to access to cancer drugs in the new Medicare prescription drug program. Health Care Reform Implementation, 2010-2011. NCCS has participated in the rulemaking process for health care reform implementation by commenting on numerous proposed rules. Among the comments NCCS has filed are those on dependent coverage until age 26; preexisting condition exclusions, lifetime and annual limits, rescissions, and patient protections; modifications to the HIPAA privacy, security, and enforcement rules; coverage of preventive services; clinical quality measure concepts for stage 2 and stage 3 meaningful use; accountable care organizations; and establishment of health insurance exchanges and qualified health plans.NCCS also testified on essential benefits necessary to cancer survivors at an Institute of Medicine hearing convened to inform the IOM panel’s work on essential health benefits. Clinical Trials Coverage, 2000. NCCS joined with the American Society of Clinical Oncology and other patient advocacy groups in pursuit of legislation to require Medicare coverage for the routine patient care costs for those enrolled in cancer clinical trials. After pursuing the legislation in three Congresses, NCCS worked with other patient advocacy organizations in securing an Executive Memorandum establishing a Medicare coverage policy. The Executive Memorandum, issued in June 2007, established a coverage policy for trials in all diseases. Institute of Medicine (IOM) Reports, 2001-2007. NCCS played a leadership role in the completion of a series of IOM reports that describe cancer care and the shortcomings of the system for cancer care and survivorship care and also identify possible reforms of the system. Former NCCS CEO Ellen Stovall served as Vice-Chair of the IOM Committee on Survivorship, co-edited the IOM Report on Adult Cancer Survivorship, was the principal reviewer for two IOM reports and was the lead external advisor for a report on psychosocial issues and cancer. NCCS is a sponsor of the ongoing consensus study, Improving the Quality of Cancer Care: Addressing the Challenges of an Aging Population. Cancer Quality Alliance, 2005-2013. NCCS has enjoyed a strong partnership with the American Society for Clinical Oncology in forming the Cancer Quality Alliance (CQA), a collaboration among 28 organizations to encourage the sharing and implementation of cancer quality measures and tools to improve cancer care. NCCS co-chairs this Alliance with ASCO. “Blueprint” for Quality Cancer Care, 2008. NCCS was a leader in the creation of a “Blueprint” for quality cancer care, which was first published in the journal Cancerin September 2008. Conceptualized and written through the collaborative effort of the CQA, the Blueprint is available as a teaching tool to improve the care for people living with, through and beyond a cancer diagnosis. ASCO Quality Care Symposium, 2012. In 2012, ASCO held its first Quality Care Symposium, co-chaired with NCCS, and brought together researchers, patient advocates, health system administrators, and practicing physicians to share results in measuring and improving the quality of cancer care. Sign up for NCCS Updates!